Embrace these exciting seasonal tastes by making a one-of-a-kind margarita bursting with holiday flavor from cranberries and pomegranates. Add ice to the reservoir and all ingredients to your Frozen Concoction Maker® of choice. Mix your concoction and serve with pomegranate seeds as garnish. 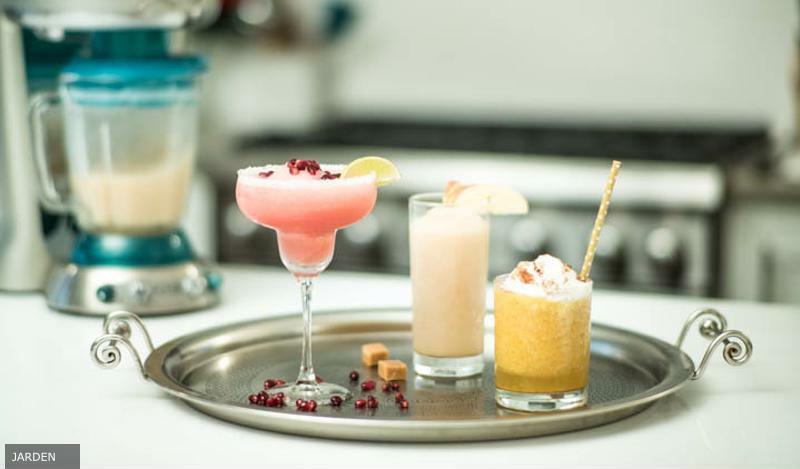 Try out these refreshing frozen concoctions this holiday season. A delicious slice of pumpkin pie is the perfect way to cap off a holiday feast. Give new life to the classic pie by transforming it into a fun and festive frozen concoction that tastes just like pumpkin pie - but with a little kick! Add ice to the reservoir and all ingredients to your Frozen Concoction Maker® of choice. Mix your concoction and serve with a swirl of whipped cream. Juicy, tangy and covered in a caramel coating, caramel apples are the king of fall treats. Celebrate the fun-loving spirit of this concoction on a stick with a frozen concoction that tastes as good. Add ice to the reservoir and all ingredients to your Frozen Concoction Maker® of choice. Mix your concoction and garnish with apple slices. A tiki bar next to your Thanksgiving table is the perfect fun-loving touch for a tropical holiday. Place your Margaritaville® Frozen Concoction Maker® in the center of the table, then surround it with all the fixings to make deliciously refreshing and festive frozen concoctions in seconds, such as pumpkin, cranberry and cinnamon liqueurs and garnishes like apple slices, pineapple wedges and cherries. Prepare glasses beforehand by dipping the rims in margarita salt, brown sugar or cinnamon. Adding a colorful paper umbrella is the perfect touch before serving the drink. A free-spirited blend of autumn and island decor starts with the table - a few yards of macramé makes a great bohemian-inspired runner. On top, arrange a mixture of palm leaves, grapefruit, pineapples, coconuts and pomegranate for some colorful punch. For a centerpiece, create a cornucopia, which can include a variety of tropical fruits, colorful exotic flowers and palm fronds. For lighting, skip the traditional candles and go for tiki lanterns strung across the ceiling and windows. There's never a lull in a Thanksgiving party in paradise, so make sure the vibes of your Thanksgiving match the fun-loving spirit! Play island music in the background to create the right laid-back atmosphere as you and your guests dig into your paradise-worthy feast. Before dinner - or after, when everyone's rested from the meal - gather the gang for some fun party games. Coconut bowling, whether indoors or outdoors, is sure to be a hit.